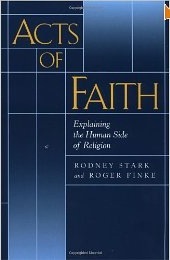 Acts of Faith, Explaining the Human Side of Religion, by Rodney Stark and Roger Finke, provides a framework for understanding what religion is, why religion is not going away in the face of "secularization" and why some religious movements flourish and why others flounder. When this book was published in 2000, Fr. Andrew Greeley wrote: "Acts of Faith is the single big book in the sociology of religion in the past decade, a monumental effort that both demolishes old theories and creates brilliant new ones." Anyone who reads this book will gain a clear understanding of what Unity must do in order to grow and prosper. The Churching of America 1776-2005, also by Stark and Finke, explains much of the same content as in Acts of Faith, but from a historical context. 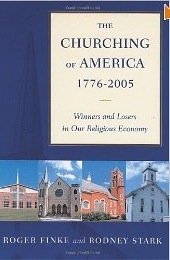 It is an engaging, inspiring story about the growth of churches and church membership in America. As the book reminds us, we live in a healthy and vibrant religious economy. The New York Times review said: "If Roger Finke and Rodney Stark are right, the current understanding of American religious history ought to be turned upside down ... a pugnacious book." Shouldn't such a book be in the current discussion about Unity? Stark's groundbreaking work with William Bainbridge, Of Churches, Sects and Cults, written in 1979, helped me understand why the Unity movement has been plagued by the spiritual potpourri ever since the first field ministries were established in 1900. Unity and other "metaphysical religions" are susceptible to becoming a "client cult", which may be characterized as a platform for various magicians who provide services to clients of a supernatural nature. There's nothing wrong with affinity or discussion groups, but, as we're reminded in Acts of Faith, there is no church of magic. 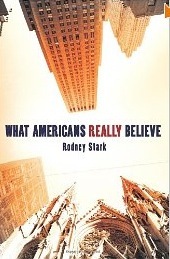 Rodney Stark's 2007 book What Americans Really Believe clarifies why today's Unity message isn't resonating with 85% of the American population. The fact is that most Americans aren't concerned about the devil and hell, but they're really put off by credulous New Age nonsense like Bigfoot, crystals and channeling. This book convinced me that the Unity movement, by abandoning it's sectarian relationship with the churches, has positioned itself to be attractive to less than 15% of the American religious consumer.